INCLUDES THE SACRED ALL-PURPOSE TALISMAN OF POWER; CUT OUT FROM BOOK OR MAKE A COPY AND CARRY ON YOUR PERSON. FOR SUCCESS IN LOVE, MONEY, HEALTH, AND PERSONAL PROTECTION! MORE POTENT THAN PRAYER THESE FORMULAE GO STRAIGHT TO GOD'S HEART, ASSURING CERTAIN RESULTS! 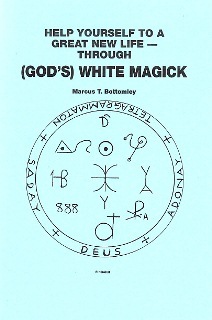 Now you can use the actual secret names of God in powerful, safe White Magick ritual! In opposition to the black magick rites of Satan these are the beneficial rituals of God - true White Magick which brings only good. With God's magick you can affect HEALING OF YOURSELF AND OTHERS; FINANCIAL SECURITY; LOVE AND HAPPINESS; and all the blessings God intended you to have! In this book you will read of how one man healed his sick mother, won a £1,000 lottery prize, and received a job promotion - all in the space of one month! It was the Deus Chant ('Deus' is the Latin name for God) which changed his fortunes. Read also of how an unknown singer got her big break after trying White Magick. You can usher only good into your life with the awesome protective powers of your Creator, says Marcus Bottomley! Never lack for anything again! The Zadok Chant enabled a young woman to cure her hearing problem and get back her boyfriend - all in three weeks! Full details in the book! The rituals of White Magick are safe - merely performing them will make you feel good, and you will get an irresistible feeling that they will work! You will get lucky with White Magick chants! As did a lady in Baltimore who won a $15,000 lottery, only to win another $2,000 two weeks later! These wins enabled her to make the trip to Europe that she had always wanted. A 62-year old Manchester man won £2,500 in six bingo games after using the Deus Chant. He then tried it for a new girlfriend. Previously he had no luck with women, but the chant brought him an attractive lady 30 years his junior! Norman D.'s (Springfield) luck was in the pits. He had problems at work, he lost money in bad investment, and his wife walked out. He turned to White Magick: he was soon on a winning streak at the race track, his health improved, and his wife returned. A shopkeeper in Shepherds Bush, West London saved her failing business after finding the ancient Adonay Chant that had been in her late mother's possessions. Trade miraculously increased three-fold! A man was anxious for his depressed sister whose husband had recently died. Although he had doubts as to whether it would work he performed the Shaddei Chant without her knowledge. The change in her personality was remarkable! She soon went about building a new life for herself. Alan B. from Ottawa performed the Shaddei Chant for his gloomy and withdrawn friend. Soon her attitude changed completely - and she had no idea why! An attractive young woman had no luck in love. Getting boyfriends was no problem, but true love always eluded her. She performed the Yesha Chant, although she didn't think it would work - she was wrong, for two weeks later the man of her dreams appeared. They have since married. You can invoke God's protection through his holy name Elohim - the Elohim Chant to See Into the Future can forewarn you through vivid dreams, and protect you day-by-day. A business man in Glasgow wrote to the author: 'A few days before I have an important business transaction I perform the Elohim Chant. Usually I dream about the person(s) I'll be dealing with; their behaviour is disclosed vividly. Sometimes I am warned not to deal with some people'. Yes - by invoking God's holy names you can gain His protection and obtain life-long blessings. YOU CAN ENJOY PERPETUAL GOOD LUCK. YOU CAN FIND A LOVER WHO WILL LOVE YOU FOR YOURSELF - AND NOT FOR WHAT YOU HAVE OR NOT HAVE. YOU CAN WIN IN GAMES OF CHANCE ON A REGULAR BASIS. YOU CAN DEFEAT THE POWERS OF DARKNESS. Yes - you can 'Help Yourself to a Great New Life through God's White Magick'.